What is JOY to you? When last did you last, with intention, make a list of all the things that bring you joy? Those little things that makes your heart sing? So often we think that joy comes from the realisation of our dreams or achievement of a specific goal. Perhaps we even think that experiencing joy will only come for us once we share our life with someone special or once we have met our soulmate. Is joy necessarily linked to an outcome? Or is JOY a way of life, a way of Being for you? JOY for me is in the smallest moments, the simplest of things – those sudden moments where I just feel my heart bursting with the JOY of life, the JOY of the laughter in that moment. The sudden shift in energy when I experience a miraculous sunset, or the unexpected act of kindness. JOY is when I allow myself some time off or watch my favourite movie – or laughing so loud that the tears stream down my face! What do you do daily to bring JOY in? Yes, sometimes we have to consciously set the intention to be JOYFULL. Sometimes we must schedule something fun. Sometimes we must move out of our comfort zones to experience joy again. Sometimes we have to laugh at ourselves. The point is, allow yourself to move into JOY. 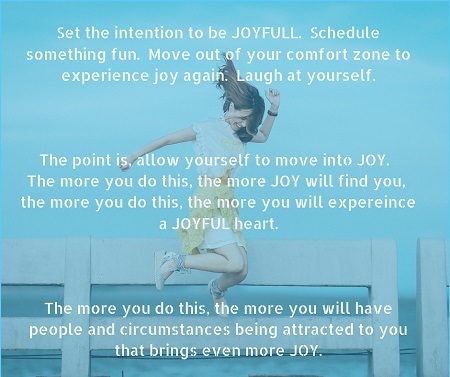 The more you do this, the more JOY will find you, the more you do this, the more you will walk this journey with a JOYFUL heart. The more you do this, the more you will have people and circumstances being attracted to you that brings you even more JOY. Just for today, make a bucket list of JOY – all the small things, the precious moments, the simple things that bring you joy. Schedule them, tick them off as you go and experience how JOY can change your life and become your strength.